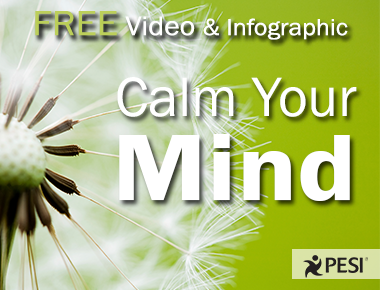 Have you ever had a client that was agitated or distracted? 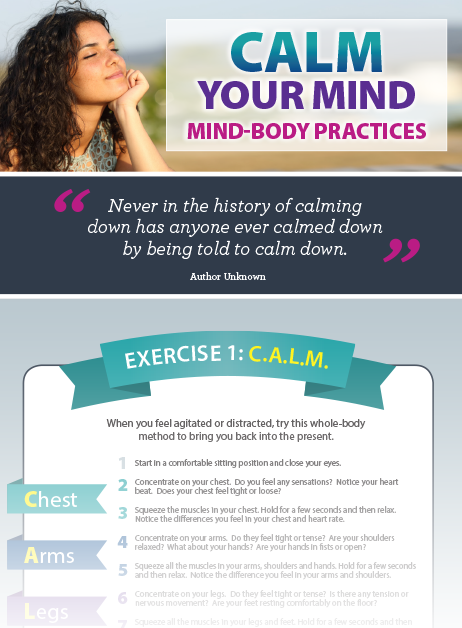 Telling them to “calm down” doesn't usually work, but this simple whole-body method can return your client to the present almost instantly. When our clients are agitated or distracted, it is essential to create a space that is safe enough for them to be vulnerable and open up to do the work necessary for healing. The CALM practice is a whole-body method that can help regulate the mind and body and bring clients into the present – by focusing on the chest, arms, legs and mind. 1.) Start in a comfortable sitting position and close your eyes. 2.) Concentrate on your chest. Do you feel any sensations? Notice your heartbeat. Does your chest feel tight or loose? 3.) Squeeze the muscles in your chest. Hold for a few seconds, then relax. Notice the differences you feel in your chest and heart rate. 4.) Concentrate on your arms. Do they feel tight or tense? Are your shoulders relaxed? What about your hands? Are your hands in fists or open? 5.) Squeeze all the muscles in your arms, shoulders and hands. Hold for a few seconds and then relax. Notice the difference you feel in your arms and shoulders. 6.) Concentrate on your legs. Do they feel tight or tense? Is there any tension or nervous movement? Are your feet resting comfortably on the floor? 7.) Squeeze all the muscles in your legs and feet. Hold for a few seconds and then relax. Notice the difference you feel in your legs and feet. 8.) Concentrate on your mind. How is the quality of your thoughts and emotions? 9.) Take a minute to listen to your brain, then clear it and open it up for outside communications. 10.) Finish by checking in with your body in general. Do you feel more calm? Do you feel more in the present? Click here to see this practice and more in action, plus access a FREE companion infographic.